Another day, another streaming media box. Quite frankly, the idea of testing yet another such device would normally bore me, but this one is different. You see, it carries the Nexus name. If you aren't familiar, "Nexus" is synonymous with a pure Google experience. What does this mean? Well, it is Android the way the search-giant envisions it. Amazon for instance, uses Android as a base for its Fire OS found on the Fire TV; however, it is very customized and doesn't have access to the Play Store. The Nexus Player is Google's retort -- showing device manufacturers how Android TV should be done. 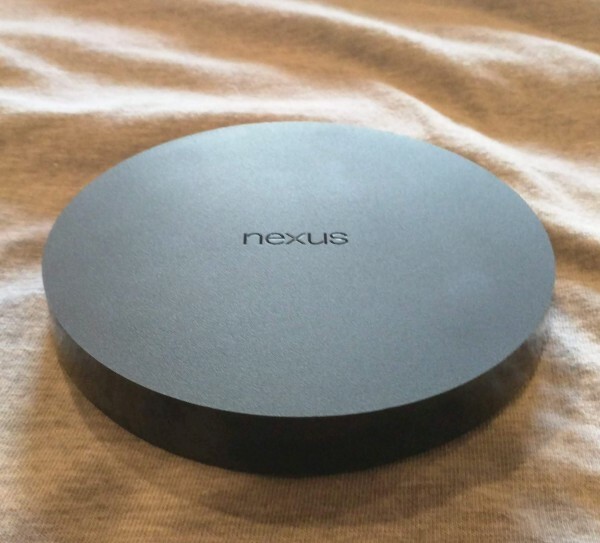 How does the Nexus Player compare to the competition? Read on for more. The first thing that you notice when removing it from the box is that it looks like a hockey puck. Seriously, it is black and round and can probably glide across the ice. The top is matte and adorned with the word "Nexus", while the rest of the body is glossy. The design is both simple and beautiful. The rear has 3 ports -- HDMI output, power, and a microUSB dev port. While the dev port is useless now, hackers will likely utilize it to enable more functionality. I foresee hacks to use it for connecting a flash drive, mouse or keyboard. 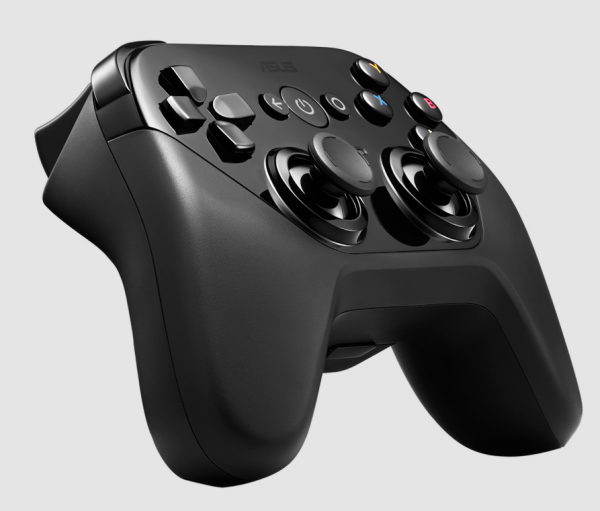 Powering the Nexus Player is an impressive Quad-Core Intel Atom processor. Yes, this means the streaming media box is powered by x86, which also increases its hackability. With Bluetooth (keyboard and mouse) and HDMI out, we can probably expect to see this running a full-fledged Linux distribution in the future. But enough about hacking, lets focus on what this is designed for -- media. Google is looking to get into your living room and be the central hub for your consumption. It's the goal of many companies, such as Microsoft with the Xbox One and Amazon with the Fire TV. For the most part, all of these devices do the same thing -- aggregate media services, while also supplying its own. Google has a secret weapon though -- Android and the Google Play Store. Well, at least I thought. Yes, the Google Play Store is available, but not all games and apps are represented. This makes sense as not all of them would work on a TV with a controller. Strangely though, games that do work with a controller are missing. Granny Smith for instance has game pad support, but I could find no way to download it. It seems that app developers need to enable Android TV support. Regardless, just know that some of the games you are expecting may not be available, but probably will be in the future. Unfortunately, a web browser is also not available on day one, which is a bit disappointing. While web browsing on a TV is not ideal, there are cases where it could be great, such as a family in a living room sharing an experience. Imagine a room full of people wanting to order Chinese food. With a browser such as Chrome, you could bring up the restaurant's website and menu, and everybody can look at once. Let's not focus on the bad, but instead on the good -- everything else. 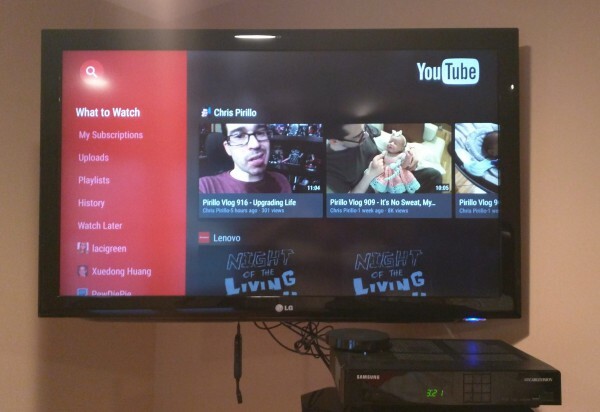 The user interface is wonderful and intuitive; the material design looks great on my TV. Whether using the remote or the game pad, you can mindlessly navigate menus without getting stuck or confused. Check out the below example of the interface. 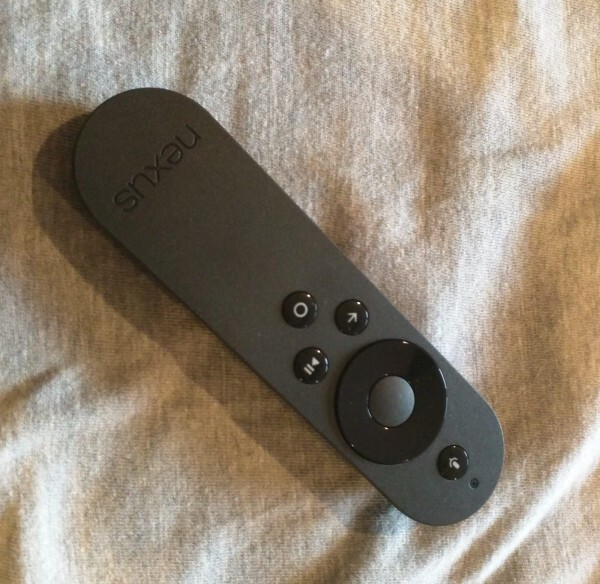 Nexus Player is controlled with the included remote, which features a navigation pad, back button, home button, play/pause button and a voice-search button. The remote feels wonderful in the hand and is extremely light, even with 2 AAA batteries inserted. The battery door is poorly designed though, as it is extremely difficult to open. Hopefully the batteries last a long time and you will not have to open it often, because quite frankly, I was worried I might break it in the process. The remote can also serve as a game controller, best used for casual games or the pass-and-play variety. 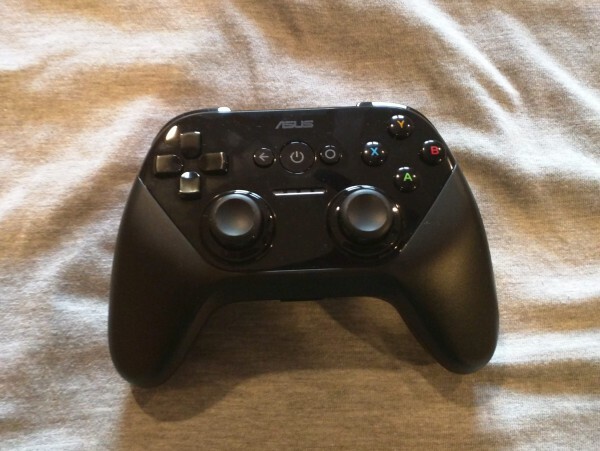 If you want to play more complicated games, you can purchase the optional Nexus Game Pad for $39. The Game Pad is extremely well-built and well-designed. Not only is it comfortable, but it feels solid, just like the Xbox One or PlayStation 4 controller. The D-pad is responsive and both analog-sticks are comfortable and clickable. The triggers have good resistance and should prove invaluable for racing games. All of your video favorites are available on day one, such as YouTube, Netflix and Hulu+. According to Google, the API is wide open and all video and music providers are welcome to offer their services on Android TV. This means that beyond offering an app, the services can be linked with search functionality. Google is the search king, so of course, search is an integral part of Android TV -- including voice. So, let's say you subscribe to Netflix and Hulu+ and search for "Tom Hanks". Not only will Android TV find movie selections in Google Play Movies, but also Netflix and Hulu+. A Google representative tells me that the search-giant wants to be sure that you can find media that is available to you at no additional charge, before you "accidentally" buy or rent it . For example, if a film is available on Netflix, and you are a subscriber, it will suggest that service first, instead of a paid rental on another service. Very cool and very noble, right? Voice search works flawlessly as expected. Again, search is Google's bread and butter and the Nexus Player shines when speaking into the remote. Every actor's name and movie title I spoke to it was recognized and displayed. As a Google Play Music subscriber, I was in heaven with the Nexus Player. Not only can I stream my music on my TV, but I can play the songs while I game. In other words, the music will play in the background, so you can turn-off the in-game music to listen to your own. This was really cool as some games have some rather lame music. Also available on the Nexus Player is the ability to "cast". Basically, in addition to all of its great features, it duplicates the functionality of the Chromecast. So, any app that currently works with the small dongle, will also work here. This means even iPad and iPhone users can take advantage of the Nexus Player. At $99, the Nexus Player is a great device with impressive hardware; however, owners of existing streaming boxes face a conundrum. If you own something like a Roku or Fire TV, the Nexus Player may not be a smart buy. You see, it duplicates much of the same functionality, and unless you absolutely need Google Play Store access, I would hold off for now. If you do not yet own a streaming media box, the Nexus Player is a good choice, especially if you are interested in gaming. Parents will see increased value in the game console aspect, as games are far less expensive than on Xbox One or PlayStation 4. Sometimes we just want kids to play a game to keep them quiet, and if that can be achieved for 99 cents instead of $50, that is a huge plus. Even though game selection is limited now, the sky is the limit and I suspect the floodgates to open soon. Gaming aside, the Nexus Player is a solid choice that should only get better as time goes on. Since the device runs Android and is powered by a powerful quad-core Atom processor, it should last you many years before thinking of an upgrade.